To exist in Errings is to experience one’s own language as an alien tongue while finding oneself miraculously capable of understanding it…. No other poet of his generation coaxes from such a sternly disciplined instrument such ravishingly lyrical music. Peter Streckfus vows for a complex, loving embrace of influence. 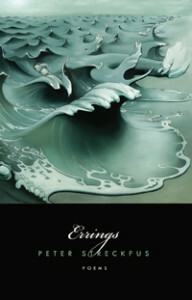 Written at the intersection of the words of father and son, through the echoing world of the father’s unpublished novel, Errings is an adventure—full of transport—in dream and time. This is lovingly tender and smart work. What is transacted here between poet and reader has less to do with the reader’s being convinced by elegant or passionate argument, and more to do with seduction. And the instrument of our seduction, for once, is not charm but mesmerizing beauty. Luminous, speculating intelligence… A radical presence on the page. 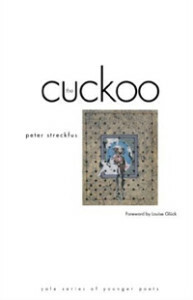 While The Cuckoo dazzled with its brilliance and mastery of voice, [Errings] dazzles with its vulnerability, its wonder at the fluidity between animal and human, life and death, technology and the natural world—the world with its subtlety, holes, and open spaces. A distinctive force of talent and mind. A book which stands among the most authoritative and promising debuts in recent years. Mesmerizing the reader with the peculiar hypnosis and acrobatic grace of the jester-bird. The tension between Streckfus’s equanimity and the ornery intransigence of his source texts… creates the finest and weirdest poems in the book. Streckfus possesses… a gift for making the object strange (something that I, as a Russian-born reader, am tempted to call ostranenie) not in its appearance but in its nature. The 2003 Yale Series of Younger Poets winner, The Cuckoo…. is a deserving recipient of the prize. Perhaps it will open the door for experimental writing to enjoy a more mainstream poetry audience.